On Friday, Phillies director of player development Joe Jordan took time to chat about several promising youngsters that have taken part in off-season leagues. Read ahead for the full interview. - During the season, Threshers pitcher Matt Imhof drew a lot of attention after he suffered a significant injury that resulted in the loss of one of his eyes. Do you have any updates to share on Matt's progress toward recovery? I really don't have a whole other than I've spoken with him, he's taking classes and it seems like he's adapting. He seems to be doing well. That's what he told me. Right now, I think that's what matters. You know, just taking some classes and trying to, you know, I would guess just trying to make the adaptations that he needs to make. But I really don't have a lot more than that to offer. He seems to be doing well. - Is the goal for him to return to the game? That will be something that if he gets to that point and that's something that he wants to do, then obviously we're going to be happy to give him that opportunity. I mean, that's the thing, but he hasn't gotten to that point that we've had that conversation. - Have you ever seen a player suffer something so significant and fully come back? As far as returning to play a professional sport? - Okay. So, as far as players that have been active this off-season, there are some bigger prospect names that competed and didn't perform as well as they did during the regular season. Guys like Dylan Cozens, Jorge Alfaro, others. Can you comment on that? I think you want all your players to go out and have success and put up numbers and this and that, but when you're talking to guys going to winter leagues in Latin America like Dylan for the first time or Rhys Hoskins or Andrew Knapp or on and on, for me the experience is really what we want them to get. It's a different game. It's slow, you know, they're four hour games. They're playing against a lot of veteran guys and they get exposed to a lot of different approaches from a hitter's stand point and on how guys pitch. So, again, I wish they would have all gone down and put up (good) numbers and that's part of what we want them to do it for, but the experience will be valuable. It doesn't change anything on our side of it as far as how we view these guys. Not at all. I spoke with Rhys Hoskins this morning and he flat out told me, 'It was a great experience, just from a stand point of how different the game is down there.' And I just think anything new, anything different- they're still young players, so it's a good experience. - I know you're able to get to Arizona each year for the Arizona Fall League, but I imagine you can't get to every country where the Phillies have players in action. Is the team able to monitor the international leagues closely? Of course! Of course! Alfaro's playing for Jorgey Velandia. Jorgey's the GM for the La Gauria club. Ramon Hernandez a former major league catcher for many years is on that staff and I think it sounds like he's had some impact on a couple thing defensively with Alfaro. But, I mean we keep track of it with personnel and scouts in all of these countries. They see the players play. I was in the Dominican Republic for a week, had a chance to see Hoskins and had a chance to see Alec Asher. It's mainly the local staff and scouts and they're the ones that keep track and offer support. So, yep, we just don't send them out. We try to keep tabs on them and see how they're doing. 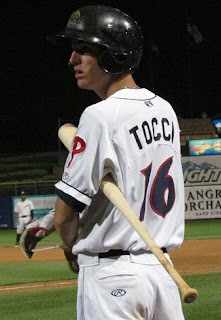 - Carlos Tocci has had a very solid campaign in the Venezuelan League and took strides with Clearwater this year. Can you share some thoughts on what he's done this year? Yeah, I mean I think it's great what Tocci is doing and he's a good baseball player. You know, he's got a feel to hit and he's as good as anyone we have in center (field). I think it's good. It's really his second year to be able to play on that team down there, so the fact that he's having that much success and the fact that he's our guy and he has a chance to continue his development, it's exciting! He's a good player. - So, you mentioned that he's the Phillies' guy and that makes me think of the Rule 5 draft having just passed. I know the team lost a couple of players, but is there relief for the club after not losing others or more than those who were taken? Absolutely. We had many of our guys' names out there and different people were asked about different guys that were eligible and I think it's, um-- we felt like the hit could have been a little deeper as far as the number of players taken. But as far as that, we lost one player in the major league phase and one player in the minor league phase and for me, you know, that's good. We like our players and we're glad to have them. - Ricardo Pinto didn't see much action this off-season with La Guaira in Venezuela, only throwing 14 innings. Was that by design or was there an issue? He pitched out of the bullpen. We had a limit on the innings. It kind of gets back to the point I was making about the guys earlier...this is a big deal to be in that environment. It's so different than the United States. It's loud, it's energy, there's a huge emphasis on winning every night, so we had a certain number of innings we wanted him to get in a certain number of appearances and the fact that he got to do that for us was good experience and leading into 2017. - Brock Stassi's had a great off-season with that same team and he's a guy that's gotten some attention after revamping his swing two years ago, with an Eastern League MVP award under his belt. What are your thoughts on him? I think in talking to Jorgey, he had a terrific first half down there in Venezuela. He's a good player. I mean, it's good solid defense every night. The last couple of years he's been a much more productive offensive player, so again I think he's a good player, he's a productive player and, you know, I'm looking forward to seeing him in spring training and seeing what he can do. 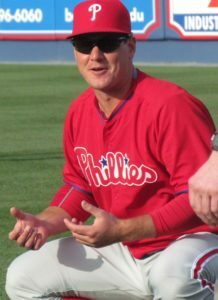 - There were reports that Tommy Joseph had his run in the Dominican Winter League cut short with a hand injury? Do you know how significant that was? I mean I just think there's nothing to it. He's fine. He's gonna be 100-percent by spring training. I think he just had a little something in his wrist that-- it was gonna be a couple weeks (or) a few weeks till he could play and this was more a situation where he didn't necessarily elect to leave, but in that environment, when you're not able to play, the commitments don't run real deep, you know, he had to come home. But he's going to be 100-percent healthy in spring training. - Are there any other guys dealing with injuries or having clean ups or procedures done that are news worthy? Not really. We've had a pretty healthy off-season. And the rehab programs for the guys that have been at the complex, with (Aaron) Nola, you know, some of our major league guys, everything's been positive, so there's really no news to report. Yeah, if we can get to the middle of February with where we are right now, we're going to be fine. - Jesmuel Valentin is playing in Puerto Rico, played at Double-A and Triple-A this year and could be on the verge of becoming a name all Phillies fans should know. Thoughts on him? Well, I mean Jes is a good player. I don't know really what to say other than he had a good year last year and I think that we were able to get him to Triple-A for an amount of time and we were able to get him that experience and that sets him up good for 2017. He's versatile and he's very good at second base. I think his bat continues to get better. He takes his walks and so a lot of guys in our system can get a lot more notice, but he's a good player and he continues to get better. - And let's not forget about the Arizona Fall League. There were plenty of guys that saw action out there. Was there anyone that made a really good impression while playing there? I think our pitchers all did a very good job. You know, (Victor) Arano is a good player that went out and did what he does. I think maybe with the exception of one outing, maybe his first outing where he had some walks, I think he was very solid. I heard good things. I think that Miguel Nunez, I think I saw Miguel twice the week that I was out there and I was happy to see what he did. (Jeff) Singer was solid. His year was kind of a whirlwind this year as far as waiting in extended (spring training) for a while. Once we got him out, he had a super year and the fact that he went out there and did what he did in the Fall League, I think speaks to his ability more than anything. He really enjoyed that. And then, for me, (Scott) Kingery-- that was the end of Kingery's first full season. I think that was a heck of a demand that we put on him. He ran out of gas in August, pretty much, in Reading and I think the same thing happened again toward the end of the Fall League. And I told him to his face, the reason that you're out here is I want you to push your way all the way to November. It will help you this year and the year after. I like everything about what Scott did this past year. (Aaron) Brown missed some time with an injury (during the regular season), so he got to go play. And then Mitch Walding had a hell of a year. His best year as a pro and went out there and did some things in the Fall League and I think that should, from a confidence stand point, set him up to, you know, return to Reading and build off what he did in 2016. Mitch is a good player and he took a big step forward last year.